Over the past four years, Marvel Studios have slowly been putting together the pieces to form The Avengers, a film version of the comic series that brings some of the studio's most powerful heroes together. The ambition of the project cannot be overstated: over five films, the studio have constructed an approximation of their comic universe that remained faithful to its origins without ever producing films that were only aimed at the converted, even if sometimes, as in the case of The Incredible Hulk, only the converted showed up. Considering the risk involved - the very real possibility that, had any of the films faltered badly in the early going, the whole thing could have fallen apart - the build-up to The Avengers alone is something quite remarkable, maybe unprecedented. Of course, all that build up has to lead to something, and The Avengers itself was always going to be the most difficult part of the whole enterprise to pull off. With so many characters with so much backstory, it would take a real delicate balancing act to ensure that each of them got their time in the spotlight without letting one character overshadow the others, or without allowing the film to devolve into a formless mess. Fears of that eventuality are allayed early on when writer-director Joss Whedon opts to slowly bring The Avengers together. Rather than leaping right into the fray, the film initially focuses on re-introducing S.H.I.E.L.D. Agents Nick Fury (Samuel L. Jackson), Black Widow (Scarlett Johansson) and Hawkeye (Jeremy Renner), as well as the Asgardian demi-god Loki (Tom Hiddleston). Loki returns to Earth with the help of a mysterious outside force, intent on conquering the planet that played such a pivotal role in his defeat at the hands of his brother, Thor (Chris Hemsworth). After Loki steals the Tesseract, an alien cube that could be used as a source of infinite power or the cause of catastrophic devastation, from S.H.I.E.L.D., it falls to Fury to assemble The Avengers, a team of Earth's mightiest superheroes, to avert an almost unimaginable catastrophe. Whedon's background as the creator of ensemble-heavy television shows like Buffy The Vampire Slayer and Firefly serves him well in The Avengers, as he manages to balance the different characters without ever letting any of them take too much focus. Although Tony Stark (Robert Downey Jr.) is undoubtedly the most prominent member of the team, having been the lead of the two most popular films in the Avengers series, it never feels like the film is just "Iron Man and Company", but like a film about a team of people who have to figure out how to work together for a greater cause. Ample attention is paid to Captain America (Chris Evans), Thor, Bruce Banner/the Hulk (played with just the right mix of nervousness and seething anger by Mark Ruffalo) and Whedon seems to be genuinely delighted at the opportunity to place these iconic characters in scenes with each other. The scenes of the members of The Avengers interacting with each other bristle with Whedon's typically clever, playful banter, and it's a joy to watch the actors spar with each other, be it verbally or the other way. And there's plenty of "the other way" on display, as The Avengers seeks to outdo not only its predecessors, but every blockbuster of the last twenty years in the action department. 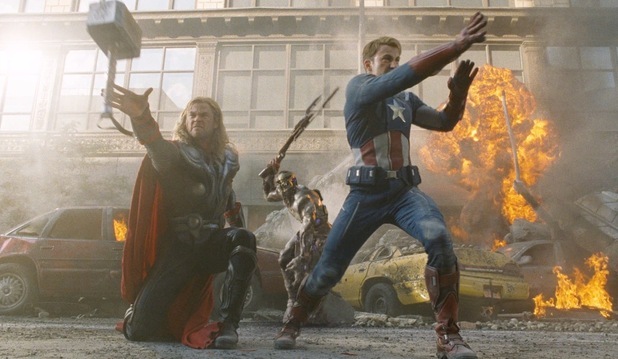 The fight scenes between The Avengers and their foes - and each other - are inventively staged, often escalating until they seem like they can't get more impressive, then even going further. This is especially true of the climax of the film, which finds The Avengers battling Loki's invasion force through the streets of Manhattan. It's probably the sequence of the film that boils the appeal of The Avengers down to its most elemental. It's the part in which pretty much every character gets their "awesome!" moment, the moment when they get to shine and be the living embodiment of forty years worth of comic history. The Hulk, in particular, gets to partake in some smashing that will make fans of the character very, very happy. Yet whilst they get great individual moments, the strength of the climax lies in the way in which the members of the team find themselves split up engaging in separate endeavours, then occasionally working together in different configurations, all in order to save the world. The Avengers is a film about a group of superheroes who fight aliens, but it's also a film about the way in which a group of broken, damaged individuals can come together to form something greater than themselves. Even though the final act is, superficially, typical blockbuster spectacle, it also works beautifully as a way of bringing the characters together and to solidify everything that they have experienced over the course of the film, and there is something quite moving about watching them struggle together for a common goal. The emotional aspect of The Avengers is, for me, what sets it apart from most blockbusters. It takes the concerns of its characters seriously, and even though the film is incredibly funny most of the time - Whedon remains one of the sharpest writers of dialogue working in Hollywood today - it also grounds its spectacle in the emotional arcs of its characters, both individually and as a team. It finds time for Captain America's sense of displacement as a product of World War II awakened in the modern world; it finds time for Black Widow's guilt over her past; it finds time for Tony Stark to rub pretty much everyone else up the wrong way. Most importantly, it finds a way to make the global personal by having The Avengers experience a tragedy that galvanises them into working together as they were always meant to. It's a canny bit of writing on Whedon's part, even if it is one of the few moments in the film that feels like it will mean more to people familiar with the preceding films than those coming to The Avengers completely fresh. That's another thing that's remarkable about the film; for the most part, it doesn't feel like the culmination of five films worth of build-up, but like a largely standalone story. There are occasional references to events in the other films, but for the most part Whedon is concerned with telling his own tale, rather than being overly concerned with those that came before him. It's that individualism that allows the film to power forward at the pace that it does, and rather than pause to make sure that everyone gets the references or is clued up on the backstory, it gets on with the business of having superheroes save the world. There's something wonderfully pure and exhilarating about that approach. Considering all the hype and build-up, it's wonderful to see that The Avengers not only lives up to expectations, but exceeds them on almost every point. It's funny, exciting and offers the kind of giddy thrill that all blockbusters should aspire to, yet rarely achieve. On top of all that, it even manages to find an emotional core for all its dazzling spectacle and witty repartee that makes the destruction mean something. Quite frankly, it sets a new standard for what blockbusters should aim to be from hereon in. There have been plenty of superhero films in the build up to the Avengers. if you are looking to catch other movies such as Thor or Captain America then why check out an online streaming service and sign up to a 1 month trial to view free movies online.